Throughout your securities industry career, FINRA, other regulatory organizations and your employer collect and maintain a variety of information. Learn about all phases of your career in the securities industry, from considering becoming registered to taking exams to obligations when you leave the industry. Considering a Securities Industry Career? If you are considering a career in the securities industry, taking the Securities Industry Essentials (SIE) exam is your first step. This introductory-level exam assesses your knowledge of basic securities industry information including concepts fundamental to working in the industry, such as types of products and their risks; the structure of the securities industry markets, regulatory agencies and their functions; and prohibited practices. To learn more about the registered representative life cycle and obligations, use the tabs on the left or download and review the Guide to Managing your Securities Industry Career. When you pass the SIE exam, you must take a few more steps before you can register with FINRA or engage in securities business. First, you must be associated with a broker-dealer, which sponsors you to take an exam, such as the General Securities Representative (Series 7) exam. In addition to passing exams, you must satisfy other requirements, such as getting fingerprinted and completing registration forms, before you can engage in securities business. Use the tabs on the left to learn more about the registration process, the registered representative life cycle, FINRA’s qualification exams and your obligations to broker-dealers and clients. Visit the SIE page to learn about the exam. For individuals who are currently registered reps or employed with a firm, you should work with your firm’s compliance department to make sure that you are properly registered, provide your firm with timely updates to your record and understand your obligations as a Registered Rep. While your firm manages most of your information, you can use the Financial Professional Gateway (FinPro) system to review your registration and licensing information available in the Web CRD®/IARD™ systems, including employment and license examinations history, as well as view open Continuing Education requirements and collaborate with your firm on U4 filings. You should also check FINRA’s public disclosure site, BrokerCheck, to confirm the information on your record available to the public is accurate. BrokerCheck displays information like registration and employment history, current registrations or licenses and exams passed, and disciplinary history. information on your responsibilities to your firm and clients. Have an open CE window? When you terminate your registration with FINRA, you remain subject to FINRA’s jurisdiction for at least two years. For example, you may be asked to provide information, documentation or to testify on the record during a FINRA examination or investigative process. Use the links to the left to learn more about your responsibilities as a former registered representative, including how to dispute information provided by your prior employer, the requirements you have after leaving your firm or the industry and the steps you need to take if you want to return to the industry. As a formerly registered individual, you can easily maintain your record through the Financial Professional Gatway (FinPro). You can view your CRD record, your Form U5 and update your residential address. If you are currently registered with a FINRA member firm, it is important that you first work with your firm (your direct supervisor or compliance department) when issues or questions arise. However, if you are unable to resolve issues or get answers to your questions please contact the FINRA Gateway Call Center at (301) 590-6500. 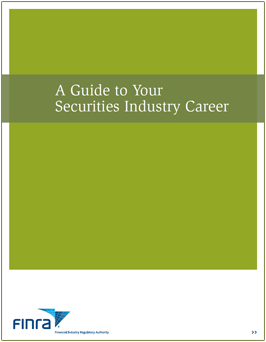 Below is a list of key resources referenced in the Guide to Your Securities Industry Career with direct URLs for each page. If the resource you are looking for is not listed below please review the brochure and select the link from the section.